Posted on May 21, 2014 by Hawaii's Local Buzz. Sir Edward Elgar’s “Pomp and Circumstance” is the soundtrack for the next month or so. Students from high schools, colleges and universities will excitedly don caps and gowns as they head in single file across pre-set stages to receive their hard-earned diplomas. It’s an exciting time as they start the next chapter of their lives. The rest of us like to honor our graduates with gifts of congratulation. If you’re looking for the perfect graduation present for the high school senior or college graduate in your life, we recommend the universal gift of chocolate. In fact, the ancient Mayans believed chocolate was a source of spiritual wisdom, so what better gift to give those who are forging a new place in the world? 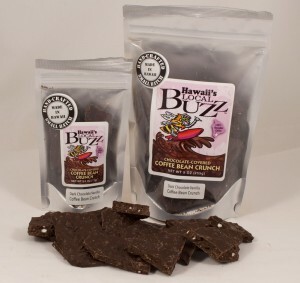 Chocolate Covered Coffee Bean Crunch: Our chocolate covered coffee beans from Hawaii are a dangerous combination. We take Hawaiian Ka’u Coffee beans and roast them to perfection. Then we mix them with Vanilla Sea Salt and drench the entire mixture in our sinfully rich Guittard chocolate. This is an especially good gift for anyone heading into college; attach a note that reads “To help you with your late night study sessions” if you include it in a gift basket. Chocolate Macadamia Nut Bark: Similar to the Chocolate Covered Coffee Bean Crunch, our Chocolate Macadamia Nut Bark consists of crushed Hawaiian macadamia nuts, mixed with one of our signature flavors and smothered in creamy Guittard chocolate. Chocolate Covered Macadamia Nuts: These aren’t your average chocolate covered macadamia nuts; we start with 100% local macadamia nuts and treat them when one of our three sweet-and-salty signature flavors, Vanilla Crunch, Caramel Crunch and Cinnamon Bun Crunch. Then we drizzle decadent layers of chocolate to coat them completely. These treats are the perfect way to reward the years of hard work that led to the auspicious moment of graduation. Take a look at our website to order chocolate covered coffee beans from Hawaii and other chocolate-themed graduation treats.